Well known for integrating high end features at affordable price points, Kral Arms brings us the Knight! Kral's first multi-caliber capable platform, gives the user the ability to change calibers quickly and easily. Featuring a tried and true magazine system that delivers reliable follow up shots just as fast as you can operate the smooth side lever action. The Knight also features Kral's standard transfer port power adjuster. Not only will this allow for customizing the performance of your Knight, but it will also aid the transition between calibers should you choose to purchase a different caliber barrel and probe. Fed by a huge 500cc cylinder, expect long shooting sessions without needing to refill. Air the Knight up to 200 BAR and shoot until your heart and trigger finger is content! 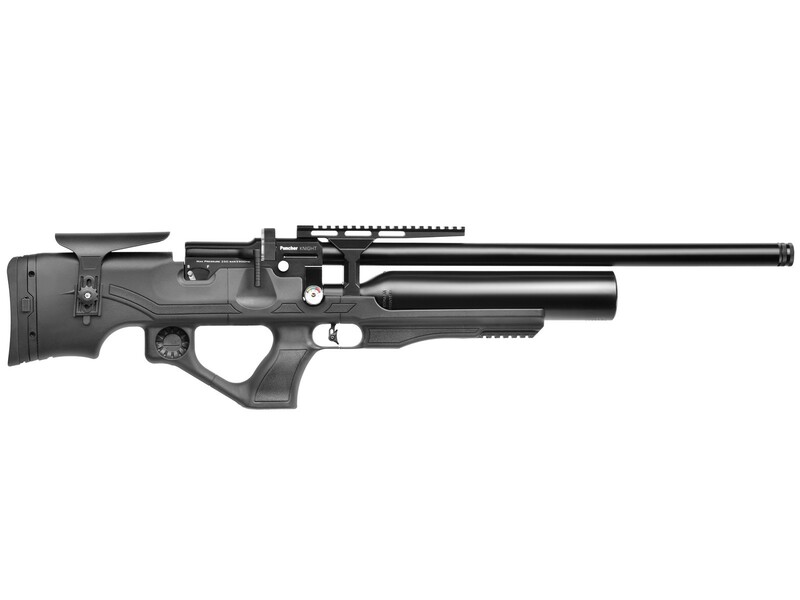 The unique thumbhole style synthetic stock is ergonomically friendly and suitable for shooters of all sizes. Featuring built-in storage space for spare mags and a forend picatinny rail to mount a bipod and other accessories, it's difficult to find features the Kral lacks. An easily adjustable cheek piece rounds out the feature rich stock.